• This plastic bucket pump is designed to fit a 5-gallon (20L) pail and is ideal for transferring non-corrosive fluids of light to medium viscosity, such as engine oil, gear oil, transmission fluid, automotive additives, machine oil, etc. • The pump is a down-stroke style and equips a fixed steel spout. • This pump is self-priming. 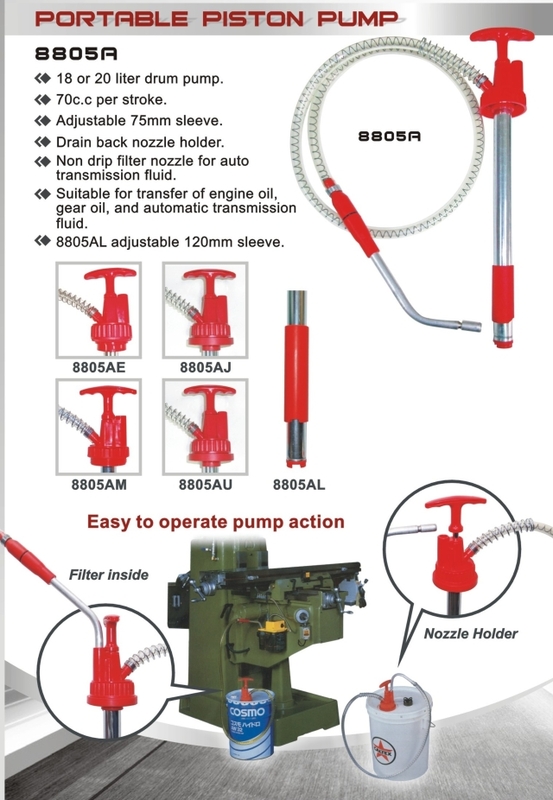 • The pump is a down-stroke style and features a drain back nozzle holder to ensure the excess oil back into the pail to prevent spills and accidents, comes with a non-drip nozzle that contains a filter inside it and a drain back nozzle holder to ensure the excess oil back into the pail to prevent spills and accidents. • The pump is a down-stroke style, comes with a 50" oil-resistant flex hose with non-drip nozzle and a drain back nozzle holder to ensure the excess oil back into the pail to prevent spills and accidents.